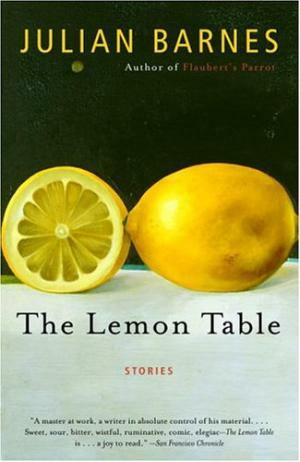 The Lemon Table, by Julian Barnes is a collection of eleven sweet and acerbic stories centered around the theme of life leading up to death. Barnes so vividly portrays each character, whose circumstances as they reach the ends of their lives are as varied as their responses, that you will recognize yourself or a family member within the pages. “The Appetite” was at first my least favorite story, but it has stayed with me. I hear the voice of Viv’s husband who was once so tender as to declare, “Viv, I want to have a long affair with you, after we’re married.” Now at the end of their marriage, senility has made him prone to vial and vulgar outbursts but there are still occasional spots of brilliance where the name of a place might bring back a memory told with words that paint a picture. More and more though, Viv must be content with a simplistic banter that holds a meaning all its own. Each repeated word, an echo of his former self. Viv continues with what has now become their evening ritual. She waits till his eyebrows lift, signalling approval as she calls out dinner options from the cookbook. Oxtail Soup perhaps or maybe tonight it’s Steak and Kidney Pie. Steak and Kidney Pie. And so she reads the recipe aloud. “Cup,” he repeats. “Or,” he repeats. Then he smiles. And for a moment I’ll be happy. Partners remember and notice different things. He makes sense of the map while I can’t take my eyes off the people. He remembers the name of the churches while I remember how they felt. When you’ve been together for just so long, you let go of having to know or concern yourself with the things that don’t interest you when you know someone else is tracking them. It’s not that you can’t, you just don’t. When I first went back to living on my own, I quickly discovered and took pleasure in the fact that I could handily install light fixtures, assemble furniture, and put up my own blinds and curtain rods. Guys have these things called tools, I realized. Once you learn how to use them, its takes all the mystery away. And the funny thing is, the tools were always there. Still, that pride in one’s independence is no doubt sweeter when there is someone to share it with. So when I turn to the recipe book to make something of the apples stored from my fall harvest for tomorrow’s book group discussion of The Lemon Table, I smile every time I see the word “cup” or think of a substitution to follow an “or.” Perhaps on a difficult day, Viv adds a “heaping cup” for good measure. On good days, it is enough just to be familiar. In recipes and in life, it is nice to have options. And in the end, precision is vastly overated. 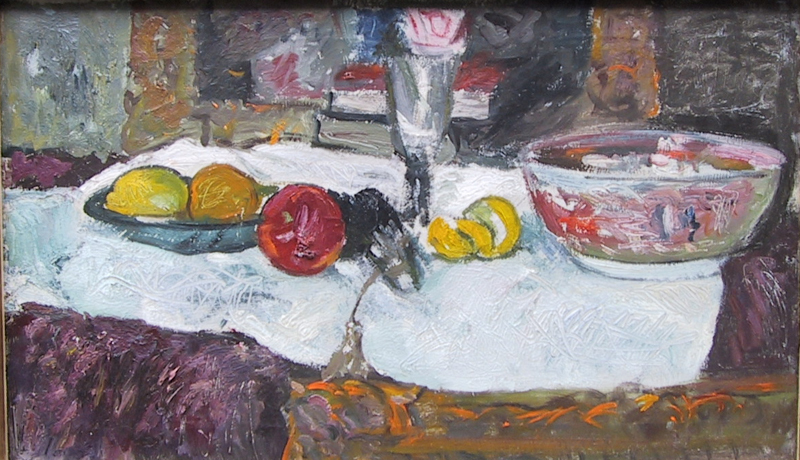 During the First World War, George Leslie Hunter (1877-1931) spent time at his Uncle’s farm, painting in the evenings. During this period his still lifes often involved every day objects sometimes interspersed with a more exotic item, in this case, the tassled fan. This still life also included a partially peeled lemon, in reference to the Dutch masters of the 17th Century that Hunter so admired. Today is Valentine’s Day and I have just returned from a highlight and cut. Not because of the day but because it was the only appointment my stylist had open for quite some time and I really needed refreshing. In the course of conversation with my stylist, I mention my blog about all things lemon. The stylist at the next station overhears and inquires, “Well, you must know the ‘The Lemon Drop Lady.’ She is stopping by for a bang trim.” But no, I have not heard of The Lemon Drop Lady. I don’t often experience such serendipitous moments and am curious to find out more. The talkative stylist obliges. The Lemon Drop Lady was an elementary teacher, now retired and substitute teaching. She is a little woman and as cute as can be; sweet and known for always having lemon drops on hand. If a student doesn’t feel good? A lemon drop is the cure. Having a hard day? A lemon drop will make it better. Of course, students may take advantage at times, but no matter. Mrs. Lemon doesn’t turn anyone away. Sadly, Mrs. Lemon’s husband died two years ago. There was a huge turnout for his funeral, for he was almost as also well-loved as Mrs. 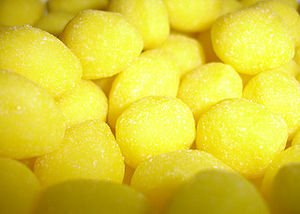 Lemon. I am excited to meet this fixture of our community. I can almost picture her: small floral print blouse, faded denim skirt, comfortable shoes, and gray hair in curls. And then Mrs. Lemon breezes in. “Oh, I had the class from hell today!” she exclaims all a-flurry before lighting in the salon chair and crossing her slender legs clad in camel leggings and neatly tucked into dark brown Etienne Aigner riding boots. She reviews her requirements with the stylist who then graciously introduces us. “I tell you, classes aren’t what they used to be!” she says by way of introduction and I can’t help but nod along. “What’s your best lemon drop story?” I ask, thinking of all the children she has encountered over the years. Mrs. Lemon’s trim is complete and she wraps up our conversation. “It was so nice to meet you,” she says standing where I can now see her. I note the stylish petal pink cable knit sweater, manicured nails, and matching pink quartz earrings. “Go home, have a glass of wine, light some candles, and take a hot bath,” my stylist tells her, knowing she will return to an empty house this Valentine’s. “I will if you will, girlfriend,” I say and we high-five. Mrs. Lemon schedules an appointment to touch up her highlights in a few weeks and breezes out the door as blithely as she entered. If you know a Lemon Drop Lady, please don’t reveal the secret behind the magical powders and sugars that she gathers from her travels around the world and sprinkles lovingly over each drop. And when their sweet and sour powers spread tingles on your tongue, just close your eyes and believe.